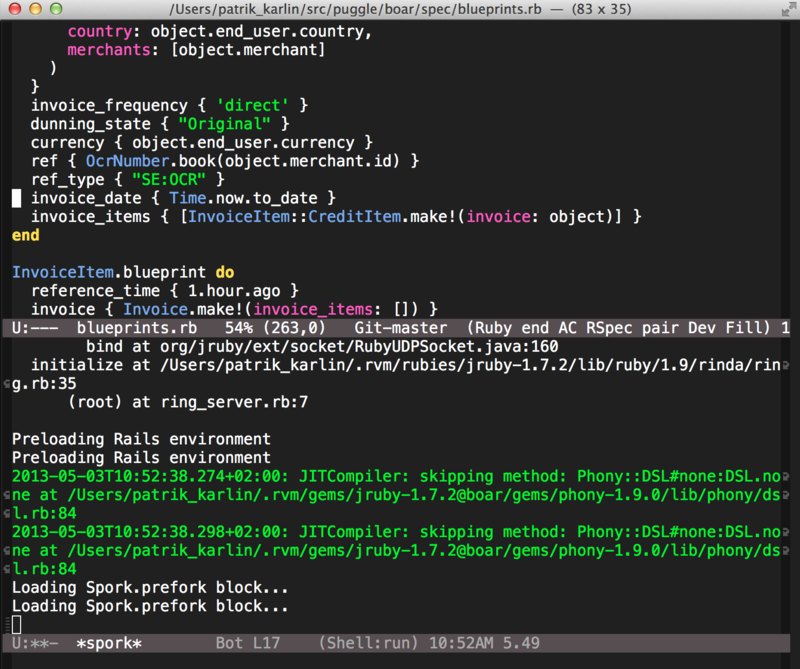 We recently made the shift to TorqueBox here at Zimpler, and that meant moving from MRI to JRuby. I order to cope with the slow start-up induced by the JVM we started using spork and nailgun for running our tests. Spork preloads instances of your application for you to have faster startup for your tests. And nailgun (wich comes with JRuby) is a lower level tool to have jvm instances ready to go. Both of them stay alive between test runs and can get “corrupted”. You also need to restart spork every time you change something that is outside what it reloads between each test (blueprints for example in our case). So we (eq me and Jean-Louis) decided to spend an hour to make this a bit easier. With the answer to all technical problems! So install it (with el-get perhaps) and bind a key (ex C-c C-l) to ‘sang-start-all and run it. Start upp Spork and nailgun in separate buffers. The spork buffer will popup and it can have some useful information if you have some errors. This plugin works well for our workflow so try it out yourself.